What is the Accessibility Squad? The Accessibility Squad is a team of volunteer students and employees that helps break down barriers that hinder access campus resources. The volunteers will be stationed across campus to provide in-person accessibility assistance to students and staff. They will help ensure easier access to resources and information available on campus. The boots-on-the-ground team provides in-person assistance and information to people who may face barriers to accessibility on campus during day-to day-activities or special events. It is also responsible for identify accessibility barriers and reporting them to the Human Rights Office. Team members wear black and white Accessibility Squad vests, which make it easy for individuals requiring assistance to identify them. The accessibility ambassador team is responsible for communications and outreach projects aimed at informing people about the Accessibility Hub and the Accessibility Squad. Outreach projects can include providing lobby information volunteers, holding monthly accessible café workshops for students and creating communication materials for internal newsletters, newspaper and social media. 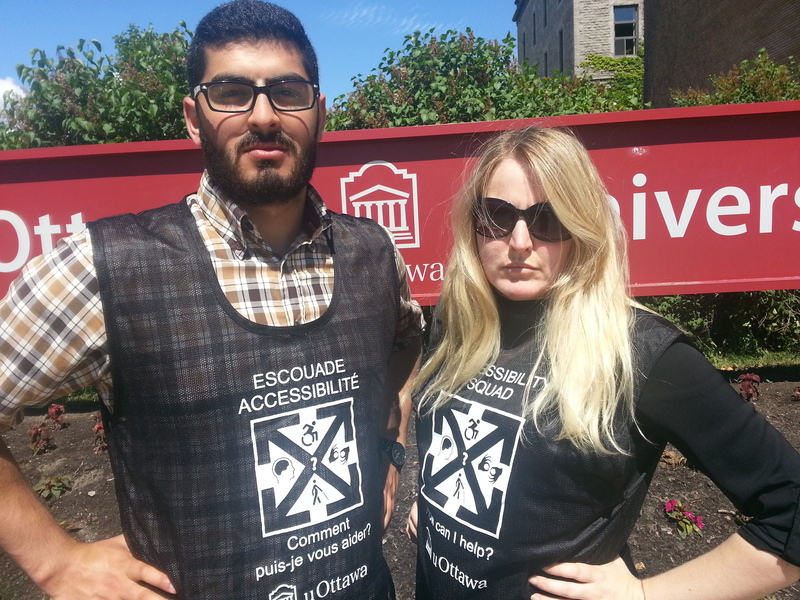 Our accessibility ambassadors may also don a black and white Accessibility Squad vest and provide assistance during public events and help increase accessibility awareness. Send an email with your questions to accessib@uOttawa.ca. Call us at 613-562-5800 (ext. 7452).